Eric has always loved football. It’s his senior year, scouts are making phone calls, a college scholarship seems secure. So why can’t he work up any enthusiasm? Because his dad has always been so closely entwined with his game, and three months ago a drunk driver unraveled everything. His dad is gone. 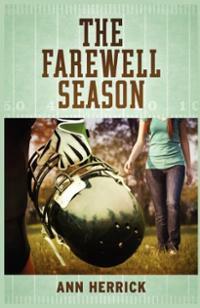 Ann Herrick does a respectable job on this novel for young adults. I appreciate Eric’s character. He’s such a jerk! But he knows it. As he works through the pain he’s willing to change, to make things right. I like his spirit, and I like that he’s not perfect. I love a learning, growing, maturing lead. His best friend Rolf, on the other hand, is too sweet, too predictable. I was glad to see him finally get his feathers ruffled. Kirstin, Eric’s sister, is also typical, but she has some great lines as she bickers with her brother. There’s some nice conflict and resolution between Eric and his mom as well. But it’s Glynnie – dowdy Glynnie with her unique style, tough questions, and ever-present pen and paper–who compliments Eric’s character so nicely. I was never sure what she’d say, how she’d react, where she would bring the story. And though we don’t see much of her, I loved the quirkiness of Glynnie’s cigar-smoking, French-speaking mom. While The Farewell Season does a nice job exploring grief and arousing sympathy in the reader, I felt the book remained a little superficial. It has such potential for depth of meaning. Consider the wonderful title. Not only is Eric saying goodbye to his father, but also to his ailing coach, his high school, a whole period of his life, but I never felt this metaphor was fully developed on all these levels. The opportunity for truth, for richness, for thought-provoking conclusions, was lost. Also, I tend to agree with Coach Pickett who “once gave us a lecture saying that if we weren’t articulate enough to speak without swearing, we had better hit the books harder.” Unfortunately, profanity in children’s literature is in vogue, and this book is no exception. I do appreciate, however, the sweetness of romance that Ms. Herrick maintains. She does not follow the current teen trend toward obsessive, physical relationships. Rather her story encourages friendship, respect, and the freedom of each individual to maintain their own identity. Its light-hearted innocence is downright refreshing. And I say, kudos!